We had a fantastic time on our mini-vacation to Santa Fe, NM. Some of our relaxing time was spent playing the game PAX. The weather and the Santa Fe environment were ideal for some serious relaxation and a game of PAX. Pax is a great travel card game in that you can throw it in your carry-on bag and it doesn't require lots of table space. 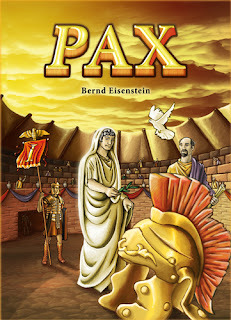 Also, Pax is fun to play - nothing like defeating the Romans in Santa Fe. Learn more about this fun card game by reading our Game Profile - just click here on Game Profile: Pax.